Saskatchewan is the middle province of Canada's three Prairie Provinces. It has an area of 651,900 km² (251,700 mi²) and a population of 1,117,503 (Saskatchewanians) as of January 2014. Most of its population lives in the southern half of the province. The most populous city is Saskatoon with a population of 260,600 (2011) in the Census Metropolitan Area (CMA), followed by the province's capital, Regina with a population of 210,556 (2011) in the CMA. The province's population makeup is also notable for German being the largest European ethnic group and also for the largest proportion of people of indigenous descent of any of the provinces. There were also 175 single-language responses for Non-verbal languages (Sign languages); 170 for Amharic; 155 for Turkish; 140 for Sinhala; 135 for Slavic languages n.i.e. ; 130 for Slovenian; 120 for Pashto; 115 for Malay; 115 for Malayalam; 115 for Thai; 110 for Ilocano; 110 for Khmer; 100 for Celtic languages; and 100 for Sino-Tibetan languages n.i.e. In addition there were also 6,080 responses of both English and a non-official language; 245 of both French and a non-official language; 1,130 of both English and French; and 140 of English, French and a non-official language. Figures shown are for the number of single language responses and the percentage of total single-language responses. The 2016 Canadian census counted a total of 112,490 immigrants living in Saskatchewan, 47,935 of whom arrived in the previous 5 years. With increase immigration from highly religious countries such as the Philippines, the Christian population continues to rise, particularly the Catholic denomination, as well as small amounts of Protestants. 151,455 people declared themselves as without religion. ^ Canada's population Archived November 4, 2008, at the Wayback Machine. Statistics Canada. Last accessed September 28, 2006. 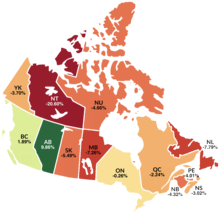 ^ Statistics Canada. "Population by religion, by province and territory (2001 Census) (Quebec, Ontario, Manitoba, Saskatchewan)". Retrieved 26 July 2015.